Ever wondered why we love balloons so much? Are you still wondering why? It is because they are a happy, cheerful and colorful way of saying, have a fabulous party. If you’re thinking of throwing a party and want to go all in, balloons have definitely crossed your mind. Adding balloons to an empty party hall takes up a lot of place and fills the room with a lot of good cheer. Don’t you just love it when the room is full of colour? What are you waiting for? Get some balloons and fill that room up with the brightest cheer. There’s nothing like having a room full of balloons and a cake full of candles on your birthday. In addition to filling the room with colour, balloons float up above people’s heads, meaning that they make the room look decorated and party ready without actually taking room away from the guests or meaning the table will be any more cramped! If you’re in love with the shape of things, push and pull to make an animal. Think about making a balloon toy. Balloons aren’t just decorative they help with a trick or two. Or if you want to impress that special someone decorate the room with heart shaped balloons for a valentine’s day she will never forget. Or make a bouquet with different shapes to make a dull place a full of fun place. Imagine the amount of games you could come up with when there are balloons involved? Some of them being surprise pop protect your balloon, balloon and spoon race, balloon people, balloon power, balloon painting, balloon waddle games and trust me the list goes on. It’s exciting to have a balloon game and win a prize for saving your balloon. Sounds fun right? Our favorite being surprise pop, you never know what’s coming out of it. Get funky with helium balloons coming in different sizes, shapes and figures. Watch out for funny quotes or even action figures that are just too cool for school. They also last longer which is great if your party goes into the wee hours of the morning. If you get karaoke going, helium can make the already funny singing voices of your friends and family sound absolutely ridiculous! It’s sure to be a fun time once you start singing with helium – especially if you can get someone who normally has a very deep voice to have a go! Helium also makes the clean up the next morning significantly more fun. Everyone has tried making funny voices as they clear a party room out – and if you haven’t then you have been doing it wrong all these years. What do you do when it’s you are in charge of throwing your best friends baby shower and you’re broke? Worry no more cause balloons are the most economical way to get your party on the go. Decorating can sometimes amount to a lot of money. Whatever theme your party is, you can always buy balloons as they are the perfect accessory to match your requirement. Be it the fourth of July or a Christmas party balloons never go out of style. It’ll even make a low budget wedding look fancy as hell if you rock it right. Tie the balloons to a weight, and you have a table decoration. Set them flying loose and your roof decoration is always changing. Tie them to your front door, and everyone knows straight away where the party is! What’s the easiest way to make a party a party? BALLOONS! Walking into a large space with no man power, absolutely no ideas and no time calls for a balloon attack. Blowing up balloons is not rocket science which makes it easy. Also doesn’t require 100 men to set it up. 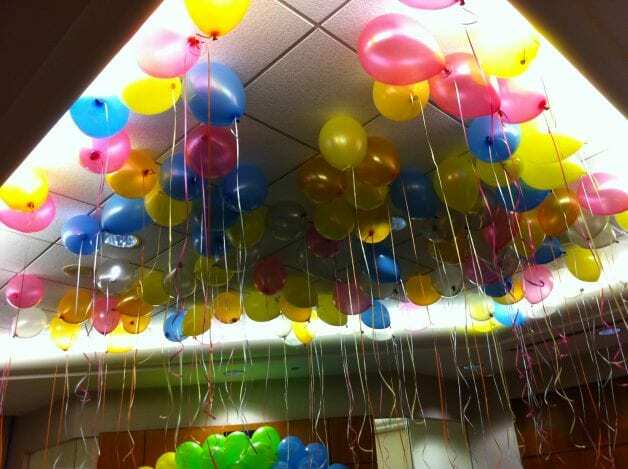 Cover the room up with balloons very where and it’ll still look like you put in a lot of effort. That’s how we effortlessly put in effort. You can transform an empty space to a Disney party in no time with the right balloon in hand. Are you thinking of giving it a try? Take your decoration details to the next level by giving the regular old balloons a fun twist. By hanging them upside down instead of using helium can be easy on the pockets and is a lot more artistic. What about wrapping a piece of cloth over it and tying it up with a nice bow? Won’t that look just wonderful? Personalise balloons by adding text to them. You could print a date or venue onto them and make it a fun invite. Be unique and add a monogram to your balloon to kick in that magic at your engagement party or spell the number of your age out at your birthday party using balloons. “Give me a bunch of balloons and I will change this place forever”, said intelligent party throwers. Having a bunch of balloons always comes in handy for those who love to rave and repeat. All you party people out there, get some balloons and get things going. What time is it? It’s time to PARTAAAY!